These days we all seem to enjoy Social Media and our SmartPhones. I remember one time I was complaining that someone had not answered an email I had sent for an entire day and I just could not believe it. Someone said to me, “Not everyone spends all their spare time in front of their computer, tablet and phone!” I was shocked to hear that statement. I thought to myself, well then, what do they do?! I think I always have a computing device with me and I am using it. Tablet or phone in bed or while on the go, laptop every other time. It is just the way our lives have moved these days. I am sure that you can relate! So imagine now, a virus. I think of computer viruses, malware and everything of the sort and I get heart palpitations. Imagine the cost of getting an unprotected device fixed. Argh! Often though, we leave ourselves and our devices vulnerable in ways that we are not even realizing. Think about Social Media…………Is your Facebook account protected? The first thing you should be doing to protect your Facebook Account is to ensure that you have your security settings on correctly. It is really important to ensure that your kids, if over 13 and old enough to have a Facebook Account, have their profile secure as well. Securing a Facebook profile can be confusing so to find out the easy steps to get this done, and done right, visit the ESET How To Secure Your Facebook Profile page for step by step easy instructions. Part of keeping our Social Media secure is know which links and ads are okay to click on and which are not. Some of the most important links to never click are any that mention diet, gift cards, one time breaking news stories not seen anywhere else and posts begging for you to Like them. You can check out the ESET’s article Five Social Posts You Should Never Click to find our more on what you should never click on. If you want to have more security, then I recommend having a Social Media Scanner. Yep, they are out there and ESET has an awesome, free Social Media Scanner that I use and that helps keep my Facebook profile safe and sound. The other thing that so many people seem to forget is that their SmartPhone is a computer and yes, it can get a virus. Imagine you are sitting waiting for an appointment and to pass time you are enjoying Facebook on your SmartPhone. Luckily you downloaded the ESET Social Media Scanner so your profile is safe, but you set your phone down for a second to make an appointment or to look at something. You get distracted and called away and uh oh…..your SmartPhone is left behind. Feel that heart palpitation just thinking about it? We love our cell phones so much, but they have come to be such a normal part of us, that they are falling into the category of items that we can put down and forget where they we put them just like our keys, glasses, wallet! Just the other day I was in a store when on the shelf a cell phone was there, all alone, and ringing. All the sudden a lady came running around the aisle corner and picked up her phone. She went from obvious panic to complete and total relief. Our cell phones are our lifelines these days and they cost a lot to replace if lost or stolen, so we often enter panic mode if we loose or misplace them. 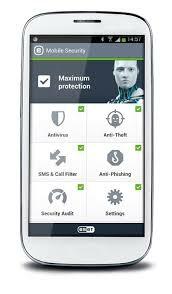 ESET has a Mobile Security For SmartPhones application. I use the ESET mobile security and I feel safe that not only is my phone protected from those pesky viruses, but it has anti-theft settings as well. In our everyday travels from home to work and other public places, our personal devices are constantly at risk of being lost or stolen. 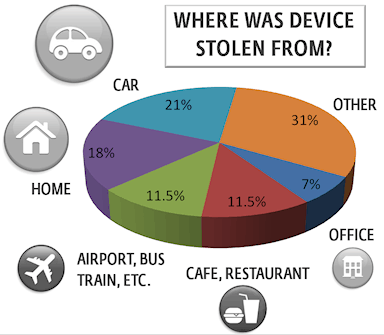 If your device is ever lost or stolen, ESET Anti-Theft lets you monitor device usage and track your missing device using localization by IP address, helping you retrieve your device and protect personal data. Once installed on your device, ESET Smart Security integrates with the ESET Anti-Theft web interface. From your my.eset.com account you can manage the state of your device to trigger monitoring if it is ever lost or stolen. When a device is declared lost or stolen, ESET Smart Security automatically begins relaying information from your device to your account. Any time your missing device accesses the Internet, ESET Smart Security sends updated screenshots, webcam images and GPS coordinates to the Anti-Theft web interface. Read more about what ESET Mobile Security can do for your phone and about activating the anti-theft. MomMomOnTheGo uses all the products mentioned above. Once setup, there really is nothing for you to do other than to enjoy your Social Media, your SmartPhone, Tablet and Laptop. Have these products every helped me? Yes, a few weeks ago someone posted something on Facebook and I received a warning from my ESET Social Media Scanner to go remove it as it was a virus in the link. A few months ago, before ESET, I might have clicked that link and had disaster ensue. My recommendation is to check out ESET. ESET has free products out there to help keep you up and running. Disclosure: MomMomOnTheGo was compensated for the purpose of conducting this review. As always MomMomOnTheGo only supports companies and products that she loves. Online security is important to me because I fear someone will find a way to invade my tablet & be able to watch my family, somehow. I’m paranoid now a days with all of the theft stories we hear. Even friends of mine have had their pics stolen from a secured setting on facebook! I don’t want to have to worry about identity theft. It is very important to me especially with a baby! I think people are too trusting and sometimes if a friend posts something I will click without checking first. You never know what kind of creepy weirdo predators are out there trying to find their next prey. Just like you never know who is going to figure out what your information is so they can hack you and steal your identity. Online safety is important to me because I have a 14 year old daughter. We have rules in place regarding the use of the internet and she doesnt have a smart phone. I feel that children do not need 3 or different gadgets for basically the same purpose. I have a small one and I worry about who can see what I post and what my son can see when he uses the computer. Wow! That sounds amazing! Sounds like something I’m going to need to get! I often worry about security. The Social Media Scanner and Anti-Theft are what interest me the most! Thanks for sharing!